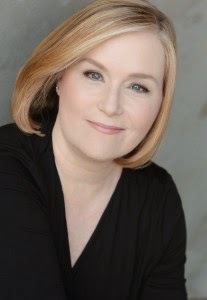 I'm delighted to welcome Tracy Solheim to TRD today! Tracy and I share a mutual love of football and romance so it stands to reason that fall would be one of our favorite times of year. If you're a football fan in the south then you already know that the tailgate is a critical element of college football season. 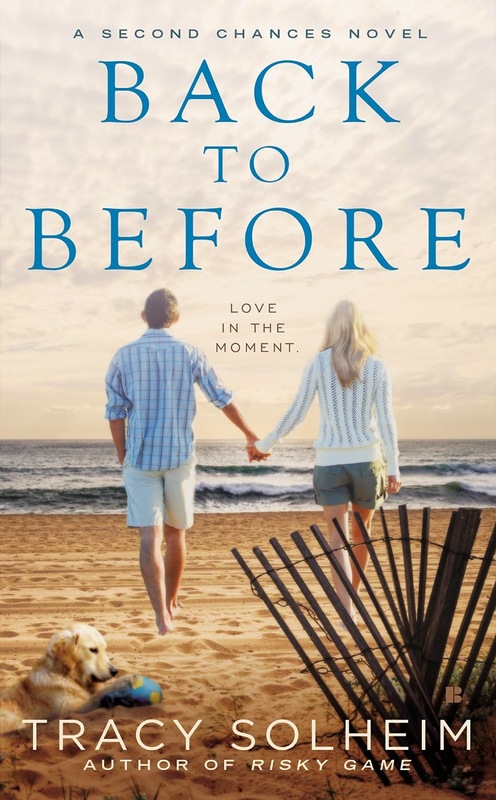 Tracy joins us today to talk football, tailgates and her awesome Out of Bounds romances! After years of writing reports and testimony for Congress, Tracy Solheim decided to put her fiction writing talents to better use. In 2013, Berkley Publishing launched her Out of Bounds series, featuring the fictional Baltimore Blaze football team. She lives in the heart of SEC country, also known as the suburbs of Atlanta, with her husband and their two works-in-progress. When she’s not at the barn with her daughter or working out with friends (i.e. lifting heavy bottles of wine), she’s writing. Except for when she’s reading, but according to her, that’s just necessary research. Thanks to the ladies of the Romance Dish for hosting me today. In case you haven’t guessed it by now, PJ and I are big college football fans! And since my Out of Bounds series, featuring Game On, Foolish Games and Risky Game, deals with football, I thought I’d talk about the most important aspect of the game—tailgating! Have you noticed that these days, the “art” of tailgating has become as competitive as the actual football games themselves? Certainly for many fans (particularly in college football), more time is spent tailgating than actually enjoying the game. Hey, if you don’t believe me, spend a football Saturday in Athens, Georgia where most die-hard fans fire up their grills or smokers in the pre-dawn hours—even if it’s night game. But these pre-game parking lot parties aren’t made up of just coolers and grills anymore. Nope. As with everything else in our society, bigger is always considered better and tailgates are no exception. They need to be epic. I mean, why bring a minivan to a game when you can bring…well, a fire truck! 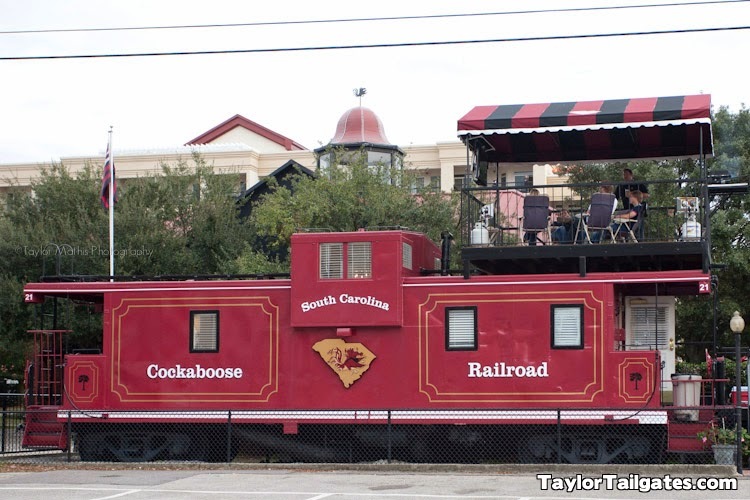 Or an actual train car. Don’t get me wrong, I still enjoy the football game—especially if we win! But I love hanging out with friends who you might only see once a year during football season. It’s the one time when the college kids are eager to spend time with the older crowd. After all, we did bring the food! I’m working on the fourth Out of Bounds book—Sleeping with the Enemy--right now and I want to include a little scene describing what goes on at tailgate parties. I’d love some help from readers. So tell me, what do you do to get ready for the “Big Game”? (The big game can be high school football, too.) One lucky commenter will get a signed book from my backlist and a fun recipe card for our family’s tailgate food—the big sandwich! Wanna talk more about football and romance? Visit me every Monday at USA Today’s HEA blog for Monday Night Romance. 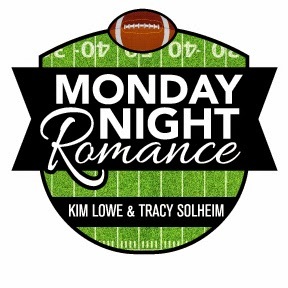 Kim Lowe and I talk about football and romance—two of my favorite things! Book 3 in Tracy Solheim's Out of Bounds series. It's been ages since I watched any football. Just a passing interest in our household. I enjoy making Chili if the Pats are in the Superbowl. Other than that I am not too big on it. Baseball is another matter! Steph, The Patriots have given us some great Super Bowls! I watched on of their wins from a cruise ship. :) Not much tailgating food there, though. My husband is big wings fan at all tailgates! We are big football followers. We are all originally from Wisconsin so we are GB Packer fans! University of Wisconsin- Madison -my husband, myself and my daughter Go Badgers! University of Florida -my 3 sons Go Gators! I've been to a lot of tailgates over the years. We tend to stick with hamburgers and brats with beer and onions, potato salad, baked beans, 7 layer salad, veggies and spinach dip and Cheetos. Dessert- bars and chocolate chip cookies Beverages we tend to stick with beer or wine coolers. I'm glad that they are going to a playoff system to determine the national champion. I'm interested in reading your books. I'm anxious to see how the playoff system works. I hope you'll enjoy my books. Please let me know what you think. We never did (and still don't) do tailgate parties but we do enjoy the games all the time. I actually try to do football day as a new dish day so we can see if we like something or not. Marea, I like the idea of trying a new dish on game day! I may have to implement that here in Georgia. Hi Tracy! Anybody who spends ten minutes with me this time of year knows without doubt my love of football. I'm currently visiting family in my hometown and will be attending my high school's game tomorrow night. It will be my first time cheering them on in person since I moved away in 1972. Should be fun! 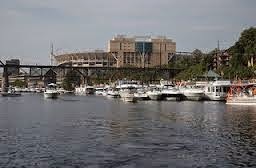 We'll be tailgating next weekend in Columbia. It's such a fun and festive atmosphere. We usually pick up a tray of chicken tenders (real, not faux chicken) from a local restaurant and supplement it with lots of dips, salads, desserts and "stuff." This year, the family sprout is living in an apartment complex close to our tailgate spot so we'll have her roommates and friends joining us for the tailgate fun. I haven't been to a game at my high school in years either! I'll have to get back to Woodbridge High in Virginia some day soon. I'll be in Columbia for the Tennessee game November 1. I'm looking forward to it. :) Thanks again for hosting me today! We are Georgia Bulldogs fans. We occasionally go to the games, but usually we have a game-watching party at home. The whole family gathers, and we have a huge spread of food. Georgia plays Tennessee in a couple of weeks, so "Here's to a good game, and may the best team win!" PJ's South Carolina team beat us in a heartbreaker! By the way, I read Risky Game and really enjoyed it! That Carolina-Georgia game was a nail biter!! My son is a senior at USC, so that's always a big game in our house. I have to miss the game when Tennessee comes to Athens--my daughter has a horse show--but you can bet I'll be wearing my orange! I'm so glad you liked Risky Game. I hope you'll give the others in the series a try and let me know how you like them. I find a good book to read . I love sport romances but not sports themselves. That's a perfect way to roll! I've never tailgated. We usually watch the games on TV and then do a lot of cooking for everyone. Kim, you never have to worry about the weather that way! And no porta-potties! We relax, have the family with food prep and enjoy. I read, stay cozy with the dogs, have a hot tea and cuddle up. To be perfectly honest... a book or my kindle :) I'll have the game on but I usually read until something exciting happens. I get bored too easily trying to watch the whole game. Thanks for sharing and congrats on the new release! I live in Georgia now and we tailgate for high school games, too! I'm not into big games unless it's KU basketball. I prefer reading to watching games for the most part. For us, high school football was a big thing. Our school was one of the 4 top teams in the division. It was county (us) vs city and 2 catholic high schools. The county/city rivalry was the most heated, both in the division and in our family. Virtually all our cousins were in the city system. Two of my brothers were on the team. The competition was serious and the games hard fought. It still stayed pretty tame compared to today. It was a long time ago, the 1960's, and there were no tailgate parties back then. The local college didn't have, and still does not have, a football team. This was all in northern NY on the VT/Canadian border. We now live in NE TN, Hi neighbor, and it is certainly a different world here today. The high school games are a bigger deal and we all know this corner of the world bleeds orange. My husband graduated from a college that is a prime rival of the Vols. He wears his team shirt to work and takes his share of ribbing. Our grandson, 16, confuses everyone by wearing a Vol hat and my husband's team shirt. I still enjoy football, preferring college ball to the pro games. The big money and rough tactics of the proteans have ruined it for me. I hope this series does well for you. I'm not much for tail-gating and although I do enjoy watching football, my first love has always been hockey. Do you have any plans to write about hockey players after you're done with the football players?